The celebration of Chaitanya’s 5th centennial advent in Vraja doesn’t come to an end as His followers are in no mood to allow Mahaprabhu to leave Vraja this time. According to the deovtees Shriman Chaitanya Mahaprabhu can’t be separated from Krishna and the holy name given by Him will spread to each and every village and town of the world. 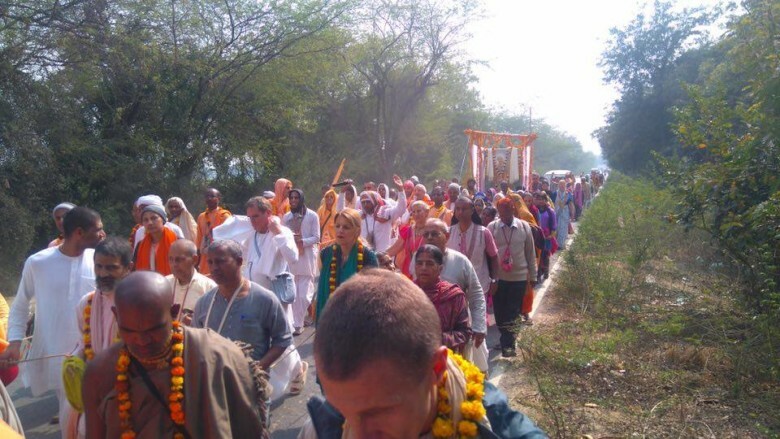 After the series of events organized in Vrindavan to commemorate Mahaprabhu’s arrival, the Goswamis of Nandgaon’s Krishna Balaram Mandir organized three days long commemoration of Mahaprabhu’s Nandgaon visit, which took place 500 years back. On the second day of the event, on Vasant Panchami, was dedicated to celebrate the appearance day of Smt. Vishnu Priya, wife of Shri Gouranga Mahaprabhu. A joint recitation of Samaj Gayan by the Goswamis, Shrimad Bhagvat Parayan, 108 Gopal Sahasra naam and recitation of Vishnu Priya Charitra was also performed. Mahaprabhu’s Vraja arrival pastime was described in Shri Goura Das’s discourse. Baba Shri Vinod Bihari Das also gave discourse on various pastime of Shri Chaitanya Mahaprabhu during his journey in Vraja. A ‘Bhakti-conference’ was also convened on the third day of the celebration in which several saints and scholars participated. Shri Kanhaiya Lal Goswami said, “When Shri Chaitanya Mahaprabhu came to Nandgaon, he had darshan of Shri Krishna Balaram, Nand Baba and Yashoda Maiyya in the cave of Nandishwar hill.” “We are commemorating the ‘Divine moment’, when Mahaprabhu entered the cave to have darshan of the deities of Krishna Balaram,” said Shri Sukhdev Goswami. 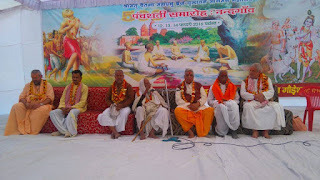 Vishnu Goswami, Nandkishor Goswami, Chail Bihari Goswami, Ramesh Chandra Goswami, Vijendra Goswami, Ex-Nagar Panchayat Chairman Tara Chand Goswami, Ram Sharan, Umesh Goswami, Bhagat ji, Mukesh Goswami, Hukum Goswami, Balmukund Goswami, Sukhdev Das (Bhagvat Niwas), Fuldol Bihari Das, Swami B. A. Paramadvaiti, Dina Bandhu Das etc. participated in the event.